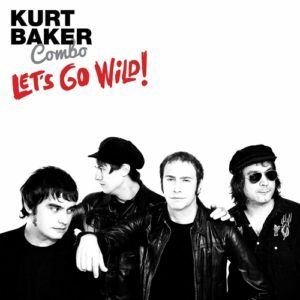 KURT BAKER COMBO – Let’s Go Wild! Kurt Baker is a very prolific musician and songwriter. In the six year stretch between 2012 and Easter 2018, whether solo or part of a band, he’s released the equivalent of at least two albums per year. Against the odds, most of the material has been great. Relocating from the US to Spain in 2013, Kurt formed the Kurt Baker Combo, a band who would ultimately inject a little more of a garage rock ethic into his gift for a power pop hook. Their first record, 2016’s ‘In Orbit’, was a little fuzzier than expected and took a bit more getting into than any of Baker’s earlier works, but still carried great choruses and a fiery energy throughout. Working to a similar formula, the Combo’s 2018 record ‘Let’s Go Wild!’, if anything, is even fuzzier. Given the rate Baker has released records, it was only a matter of time before one of his albums showed a couple of flaws. This is that record. In terms of production, some of the shinier power pop elements are absorbed by dense guitars and a world of vocal filters that sometimes make the material a little more difficult to process. At the weaker end of things, ‘Gotta Move It’ glues a curly vocal to an aggressive glam stomp and catchy chorus – or at least it would be catchy if it weren’t drowned in the mix by severely amped up guitars. There’s much less finesse in the lead work than before, with a particularly messy guitar solo on show, but looking past these factors, the band sounds as if they’re having great fun and at least the use of fake endings and a couple of extra choruses finally lets what should’ve been a great hook finally grab a hold. This is definitely a song that would have sounded much better had it been given a more 80s send off, as per ‘Brand New Beat’. Mixing dirty electric guitars with acoustic strums and squirly lead sounds that aren’t clear whether they come from a guitar or keyboard, ‘Only Way To Life’ is also a bit of a mess. A claustrophobic mix combined with heavy vocal filters render what should be a reasonable tune very hard on the ears. Baker has shown in the past that he’s capable of thoughtful, slower material but this…is far too dense by half. With those negatives dealt with, the rest of the album offers plenty of excitement, provided of course the distorted vocal filters are to your liking. A classic cut, ‘Don’t Say I Didn’t Warn Ya’ is the kind of number where the Combo really come into their own. A garage rock stomper, this fury of twin guitars and trashy rhythms moves in such a way you can almost sense the sweat on the recording. The lead break fits perfectly in its overall simplicity, while a twangy bridge lends a sense of scope. Somewhere among the rough and ready riffs there’s a catchy hook that could be from the New Trocaderos world. ‘Foolish Stuff’ is like the coming together of seventies glam, 90s pop punk and a loving tribute to the likes of The Real Kids and the proto-punk/new wave crowd. Chorus-wise, its repetitive, sure, but it only takes a couple of spins to really hit the subconscious good and hard. The Combo are tight, even though their chosen production style suggests a certain looseness. In terms of power pop and garage rock hybrids it plays to a tried and tested blueprint but still manages to be brilliant. The album’s cover tune ‘So Lonely’ (originally by Swedish band The Radio) works a fantastically choppy rhythm guitar before pitching a slightly sneering vocal against some natural harmonies in an almost call and response style. Moving into the chorus, the melody shines through the density of the recording with a throwback to the power pop gold of Baker’s earlier discs, while the enthused backing vocals even add a 60’s twist to a spot that occupies a brief but spirited solo. By the time this track fades out, chances are you’ll love it…and especially so if you’ve had a passing fancy for Baker’s time with The New Trocaderos. ‘Beg To Borrow’ takes a garage rock base and pitches it against a bouncy 70s pop style. It’s more than hinted at during the verses, but the way the main melody blossoms into something even more tuneful – with a full compliment of vocals and acoustic guitars to flesh out everything – shows a never ending love of ‘Lust For Life’ era Nick Lowe. The second half of the track is perhaps more impressive as the last verse takes time out to strip down the wall of sound to reveal a very pleasing bassline. It’s at this point you’ll perhaps start to realise the Combo are subtler players than this album’s final mix would so often have you believe. Easily the album’s best track, though, dispenses with the distortion and pulls influence from old mod sides: ‘Yesterday Today’ sounds like an old juke box classic, fusing rock and soul in a way that conjures images of zoot suits and mopeds, as echoes of The Jam‘s ‘A Town Called Malice’ meet with an old girl group hit. Kurt’s curly voice ensures you’ll never mistake it for anyone else, of course, but the addition of vibraphone sounds and a guitar solo that carries hints of Isley Brothers’ ‘That Lady’ show a broader set of influences all round. This…this…is amazing – easily one of Baker’s best; probably even good enough to forgive ‘Let’s Go Wild’ a few missteps along the way. …And if you get a New Trocs vibe from this, it’s not without good reason: chief Trocco Michael Chaney is co-writer! Elsewhere, ‘Sick of Waiting’ kicks off with an over-driven riff before descending into classic 80s power pop, with traces of the Rubinoos and Romantics lurking beneath the surface (guaranteed to become a favourite for those who love ‘Brand New Beat), while the title cut, a heavy glam pastiche that relies solely on one lyric to carry everything, feels very much like filler material. Neither track could claim to be the album’s best, but ‘Sick of Waiting’ – at least after a few spins – proves to be better than it appears on the surface. Read a review of Kurt Baker’s ‘Brand New Beat’ here. Read a review of Kurt Baker’s ‘Play It Cool’ here. Read a review of Bullet Proof Lovers’ ‘Shot Through The Heart’ here. Read a review of K7’s ‘Take 1’ here. This entry was posted in Album & EP Reviews and tagged garage rock, kurt baker, kurt baker combo, power pop, wicked cool records by Real Gone. Bookmark the permalink.